Category Archives: You’ve Got to Be Kidding! Did NSA Leaders Forget to Google “Platform” Before Stomping on Michael Hyatt’s Brand? – Resolved! buy now I’m thrilled to report that the National Speakers Association has abandoned the name Platform, which leaves the wonderful Michael Hyatt able to continue his fabulous work to build their platforms. See Shep’s video annoucement. As I sat in the audience at this year’s NSA conference — which was really fabulous, by the way — this name change completely confused me. More accurately, I felt very sorry for http://trustedtabletsonline24.org/ trusted tablets Michael Hyatt, the wildly acclaimed blogger, speaker and New York Times bestselling author of the fabulous book, Platform: Get Noticed in a Noisy World. which, incidentally, is a http://2blades.org/ generic viagra must read for any speaker or author. As you may have guessed by now, I am a BIG fan of Michael Hyatt, which is why I’m posting off topic today. Not only do I follow Michael’s blog and posts on his Facebook page, but I also often consult and implement his ideas from Platform: Get Noticed in a Noisy World. I’ve even traveled across country to attend one of Michael’s conferences, and I plan to fly to another one later this year. How can the NSA do this to https://sheisfiercehq.com/shop/ click here Michael Hyatt, who is, in effect, The Platform Man? To begin with, Michael has a big platform of very engaged, loyal followers like me. Those of us in his tribe avidly read his thoughts on Facebook; follow him on Twitter;, check out his emails; and travel to attend events where he’s keynoting. And consider this: Michael’s platform — at least on Facebook (41,770) and Twitter (224,000) — is buy now far bigger than that of the National Speakers Association, which has only 16,824 fans in its private Facebook group and only 11,600 followers on Twitter. Meanwhile, Michael Hyatt also runs his fabulous Platform University, of which I’m a member. Furthermore, he hosts the acclaimed Platform Conference. Michael also offers services to help speakers, authors and people like you and me build our platforms. By the way, stay tuned for my new, classier look, which soon will be unveiled on my website and blog, thanks to Michael’s Get Noticed theme. So why the heck is the reputable National Speakers Association — which prides itself on authenticity, originality and even ingenuity — stomping on the toes of Michael Hyatt, who, as a sought-after speaker, is essentially one of their own? Frankly, I’m disappointed and surprised by this questionable move by the National Speakers Association. Indeed, this ill-advised name change puts me in an extremely awkward position. I’m not yet a full-fledged member of NSA, but I’m a member of the amazing NSA Academy so I can develop skills to become a better speaker, which, in turn, will help me build my platform. Plus, I greatly respect the many talented, remarkable NSA speakers, some of whom are bestselling authors with remarkable platforms of their own. Furthermore, I’ve been eagerly looking forward to getting my NSA speaker certification. Meanwhile, I certainly appreciate the NSA conventions, which, as I witnessed this week and in previous years, are classy, professional events. But none of this changes the fact that NSA taking the name “Platform” is NOT a classy move. Not only that, but the NSA name change violates the organization’s own code of ethics, as Stu McLaren observes. In short, my loyalty lies with Michael Hyatt, who expressed his astonishment in a Facebook post. By the way, I even urge you to see the helpful infographic (to your left) that Michael created to help people like us build our platforms. Frankly, I’m barffled. Didn’t the NSA name- rebranding committee — whose members were praised in the video below — do their homework or due diligence, as platform builder and blogger Daniel Decker asks? Didn’t at least one member of this illustrious name-change committee do a Google search on the word “Platform” before stomping on Michael Hyatt’s brand and look? Dian’t at least one committee member hear of Michael Hyatt? As of today, you’ll get a whopping 157,000 hits! Isn’t t the NSA name change, in fact, brand theft, as Andy Traub suggests? As you can tell, a number of us in Michael’s tribe are up in arms. Sure, the concept of a platform has been dicussed for years in publishing and speaking circles and books that predate Michael’s have addressed this subject — but of all people today, Michael Hyatt is the go-to guru about the value of building your platform. In fact, Hay House, publisher of my most recent book, Beyond Sugar Shock, even recommends that ALL of its authors or wanna-be authors read Michael Hyatt’s book, Platform: Get Noticed in a Noisy World.Likewise, my next publisher, Balboa Press, which has a partnership with Hay House, greatly respects Michael. Of course, despite my background as an objective journalist, I make no claims to this being a measured post such as those by Ryan Avery or Stu McLaren. What it comes down to is this: How can a speakers’ organization, which touts the value of crediblity and not stealing others’ material, in effect, create a name and logo that are uncannily similiar to one used for years by Michael Hyatt — whether they did so knowingly or not? Now, I urge you: Put yourself in Michael Hyatt’s place. How would you feel if one day some organization took the name you’ve been spending years to brand? I’d certainly be concerned if an organization with similiar goals to mine changed its name to Sugar Shock or Beyond Sugar Shock. Issue a formal apology to Michael Hyatt. Totally abandon the name “Platform” as its new name. Do due diligence and extensive research to ensure that it won’t again pick a brand that is already taken by another person or organization. Make this entire name-change process more public and enlist feedback from ALL members of NSA and the Academy. Please weigh in with your ideas. I’d love to hear what you think, but first, watch the video below where the name change (theft?) to Platform is announced at the recent National Speakers Association conference. Join the conversation. So do you think the NSA name change is right or not? Speak up now. Also please share your comments with NSA leadership. Comments (6) | | Categories: Announcements, Beyond Sugar Shock, Book Promoting & Marketing, Catching Up With Connie, Comments, Rants, Raves & Musings, Help to Become a Marketing Maven, You've Got to Be Kidding! Join the Conversation. What most surprised you from this fascinating interview with Michael Moss? 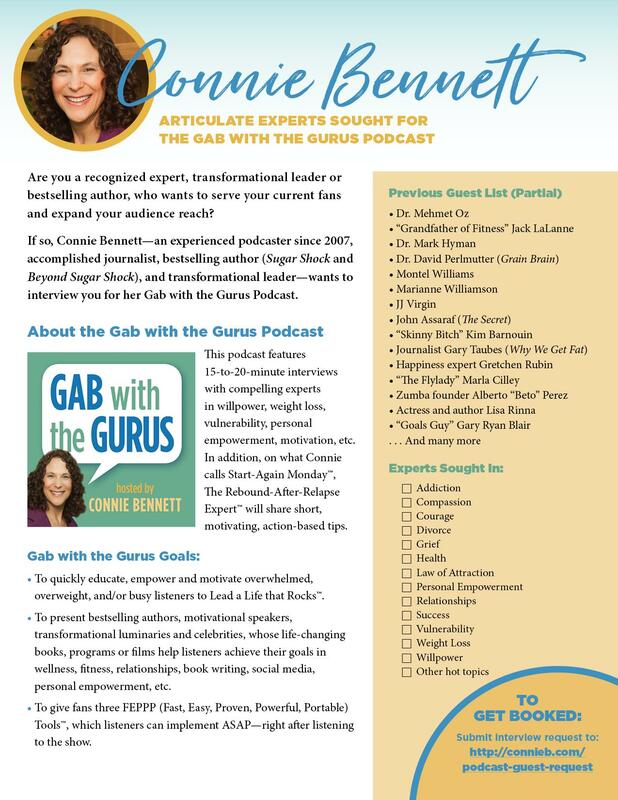 Lately, I’ve been planning the Sugar World Summit, which will feature some of the biggest names in sugar education, carb addiction, health, wellness, mindful eating, and personal empowerment. For instance, in this virtual event, which will take place two weeks before Halloween, Dr. Mark Hyman, Dr. Robert Lustig, JJ Virgin, Dr. Richard Johnson, Colette Baron-Reid, Sarah Wilson and many others will join us to give you The Sour Scoop or Sweet Solutions. Anyhow, while preparing for the event, I came across this fascinating NPR interview with Pulitzer-Prize winning investigative journalist Michael Moss, author of the extraordinary book, Salt, Sugar, Fat: How the Food Giants Hooked Us.. In his fascinating book, Moss takes an insightful look at the $1 trillion processed food industry, which most health experts believe has triggered the obesity epidemic and put millions at risk for such chronic health conditions as heart disease, type 2 diabetes and cancer. Thanks to his many revealing interviews with leading food scientists and top food industry executives from companies such as Kraft and Coca-Cola, Moss explains how most Americans have become so dependent on processed food. Get shocked now, thanks to this intriguing NPR interview. Join the Conversation. What was your biggest A-hah? Comments (0) | | Categories: Sugar Shockers, Sugar World Summit, Tantalizing Tidbits, Weight Loss Secrets, You've Got to Be Kidding! Since 1998, while quitting sugar on doctor’s orders, the subject has astounded and enthralled me. In short, I’ve been absolutely astonished by a variety of Sugar Shockers! Today begins a new Sugar Shocker! feature, which I’ll post from time to time. As you may know, I included a variety of Sugar Shockers in my first book, Sugar Shock (2007). Here’s the first such entry. It’s hard to believe, but as William Dufty recounts in his landmark book, Sugar Blues, refined white sugar was locked up back in the 16th and 17th centuries in Europe and America. At the time, the substance was so expensive (the equivalent of about $30 a pound or a year’s salary for the average working man) that it was considered a delicacy reserved for the very wealthy, and the nobility certainly didn’t want their servants stealing such an exorbitantly expensive substance. To this day, Unani healers or hakims in Afghanistan reportedly keep sugar under lock and key, believing it to be a narcotic. Excerpted from my book, Sugar Shock! How Sweets and Simple Carbs Can Derail Your Life — And How You Can Get Back on Track (p. 133). If you know of any Sugar Shockers, please let me know so I can feature it on this Sugar Shock Blog. Join the convversation. What do you think about this Sugar Shocker? Tell us now. Comments (0) | | Categories: Sugar Shockers, Tantalizing Tidbits, You've Got to Be Kidding! If you’re trying to cut out sugar or curtail your consumption of it to shed weight, manage your hypoglycemia or type 2 diabetes, or reduce your risk of heart disease, you need to read food labels if and when you buy packaged foods. That’s because many foods may contain sugar, even if you don’t think they do. And if you rush while shopping at the supermarket, you’ll never know about the hidden sugars. After 15 years of being mostly sugar-free, you’d think I would have known better to catch sweetened foods. But darn, I forgot to t follow my own advice last night, because I was really hungry and hurriedly snapped up a few items so I could hurry home to cook my dinner. Sure enough, I got duped by tasty-looking crumbled goat cheese, which I’d been eagerly looking forward to adding to my salad.. It wasn’t until I got home and was close to opening the package when I realized my oversight. My crumbled goat cheese contained sugar. In fact, it had 4 grams or 1 teaspoon, enough to cause havoc in my sugar-sensitive body. Of course, if I’d taken a moment to read the label while still at the grocery store, I would have quickly caught the sugar and been able to buy unsweetened goat cheese instead. No wonder people get so confused when buying packaged foods. No wonder people eat lots of added sugars without even realizing it. Share your experiences. Tell us about your food label challenges. Question to : When did a food label trap or tick you? And how did you feel after eating the food? My Most Popular Blog Posts: What Did I Forget? 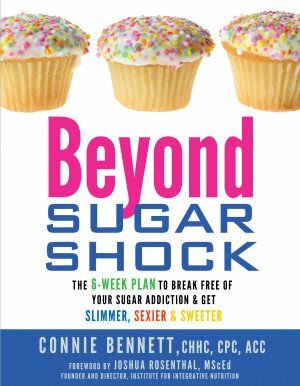 Comments (0) | | Categories: Beware of Hidden Sugars, Beyond Sugar Shock, Blood Sugar Blues, Catching Up With Connie, You've Got to Be Kidding! Eat All the Pancakes You Want & Leave Happy, Ad Says. Huh? Wrong! Frankly, I don’t get it. Here we are in the midst of a horrific nationwide obesity epidemic, and a certain national chain is now enticing people and tempting them via a TV ad to eat can eat all the pancakes they want and leave happy! Eating as many pancakes as your heart desires will not make you happy! Wait, that’s not all! Let’s assume the restaurant’s deal really entices you. So, after overeating for several days running on all that sugar (think syrup), fat (butter) and those refined carbs or sugar (the pancakes work in your body like sugar), you can expect to get even more unhappy when you look on the bathroom scale! Admittedly, you may feel “happy” ever so briefly. In other words, you’ll be upbeat and “high” from all the sugar and refined carbs for maybe 1/2 hour or even an hour. But soon, you’ll come crashing down and reality will set in. Unfortunately, you may even have more sugar cravings later that day. What baffles me is that this particular eatery does sell other food fare that’s not carb-centered. How can this company permit their ad agency to create such a politically incorrect ad in this weight-worrying climate? Why not promote all-you-can-eat salads or something more healthy instead? In case you believed the TV bunk that eating pancakes to your heart’s delight can will make you happy, I’d recommend that you learn about the dangers of all those refined carbs and sugars. Would you like to be healthy and happy? If so, then gobbling pancakes is not the answer. 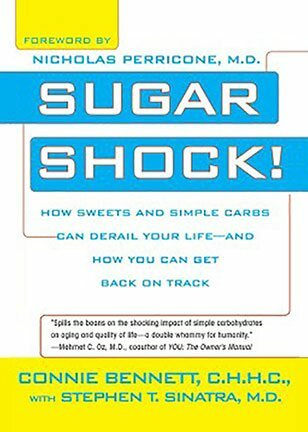 Eating pancakes, along with other processed carbs and sweets can, over time, lead to health troubles galore, from heart disease to cancer to type 2 diabetes, as you can learn my book SUGAR SHOCK! Still want some pancakes? I hope not! 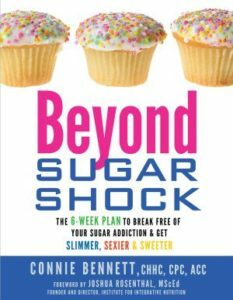 Comments (0) | | Categories: Break Free With Connie, Catching Up With Connie, Comments, Rants, Raves & Musings, Get Fit for Life, Health News & Tidbits, Lose Weight Now, Not-So-Sweet News, Nutrition News & Tidbits, Recent Research, Sugar Shockers, You've Got to Be Kidding! according to an analysis conducted by the Center for Science in the Public Interest. 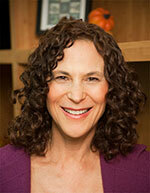 ads on Nick were for junk food,” CSPI announced. Wootan makes some valid points. Nick should be embarrassed by the fact that so many TV ads pitch junk foods that can lead to obesity, diabetes and more. It’s time, I believe, for the government to step in to prevent junk food advertising to kids. Comments (1) | | Categories: Big Sugar & Big Food News, Blogger or Web Spotlight, Blood Sugar Blues, Health News & Tidbits, Help for Sugar Addicts, Junk Food Marketing & Advertising, Junk-Food Marketing Wizardry, You've Got to Be Kidding! Got Milk Full of Sugar? Parents and health advocates, are you OK with either your kids or our nation’s children regularly having 3 teaspoons of sugar added to one 8-ounce glass of milk? Well, that’s basically what our youngsters all around the nation are being encouraged to do, starting this week as the National Dairy Council — creators of the “Got Milk? cammpaign — launches a new campaign to heavily promote sugar-filled chocolate milk in schools across the country. Hemi Weingarten, a fellow blogger at the Huffington Post, alerted us to this development. has no place in schools. Clearly, children already are in sugar shock with all the sweets they consume each year. In fact, the additional sugar in flavored milk can add up to an extra 5 pounds of body weight over the course of a school year, Renegade Lunch Lady Ann Cooper told the AP. What’s the matter with regular milk? You don’t need to make milk sweet to get kids to drink it! Comments (0) | | Categories: Announcements, Beware of Hidden Sugars, Comments, Rants, Raves & Musings, Help for Your Young "Sugar Brats", Not-So-Sweet News, Nutrition News & Tidbits, Sugar Shockers, You've Got to Be Kidding! Have you heard yet that the American Academy of Family Physicians (AAFP) — which is dedicated to helping everyone attain "optimal health" — accepted a reported $600,000 from Coca-Cola, the world’s largest beverage company? You heard me right. Big Soda will pay to "educate" you, dear consumers, about how sugar-filled beverages can be a part of your "healthy" lifestyle! Many of us wellness advocates, as well as AAFP members, are in an uproar over this misguided alliance. Talk about partners with different objectives! Last week, AAFP doctors (see photo above) even resigned over this appallaing partnership. Share your thoughts here about the doctors-Coke alliance and also join the new Facebook group, "End the AAFP and Coca-Cola Collaboaration. Comments (1) | | Categories: Announcements, Big Sugar & Big Food News, Blood Sugar Blues, Catching Up With Connie, Health News & Tidbits, In the News, Nutrition News & Tidbits, Take Action!, You've Got to Be Kidding! From time to time, findings from research studies make me marvel in disbelief. Such was the case when I recently discovered that scientists in Norway found that those of us who are non-drinkers are more depressed, AOL News alerts us. Wait a minute? Even though alcohol has been linked to health hazards galore, from car crashes to alcoholism to cancer, if you don't drink, you may get blue more often? Although I was tempted to dismiss the results, I quickly learned that this is not a study at which you should sneer. The scientists, headed up by Jens Christopher Scogen of the University of Bergen looked at a whopping 38,000 people. (It's always a good sign when thousands of folks participate in research.) What's more, their conclusions were published in the medical journal Addiction. So why the startling results? but also made them more prone to depression, according to TIME magazine. In addition, the booze-shunners had fewer social ties. alcohol to lubricate their social interactions. " What irks me about this study is that it discounts the socializing aspect of exercising and other shared activities. In addition, it ignores a Japanese study, which concluded that drinking makes the heart grow sadder. As for me, I'm sticking to my no-alcohol routine — the sugar doesn't work well in my system. And, I'm convinced, I'll be the happier for it, despite this study's questionable conclusions. Comments (2) | | Categories: Break Free With Connie, Comments, Rants, Raves & Musings, Get Fit for Life, Health News & Tidbits, Help for Sugar Addicts, In the News, Sugar Shockers, Tantalizing Tidbits, You've Got to Be Kidding! room in Seattle, where he's teaching a seminar to hundreds of fans. client, "Could you please take the elevator?" and survey the flights he's already covered and those to come. the stairs represents a metaphor for being stuck. Excuse me? Exercising by climbing stairs isn't a smart habit? Not in "Love Happens." Read the rest of this column at my new Smart Habits of Highly Successful People blog on Psychology Today. Please share this post with friends and loved ones. And let me know what you think about my new Smart Habits column. Comments (0) | | Categories: Announcements, Blogger or Web Spotlight, Catching Up With Connie, Get Fit for Life, Get Inspired, Support This Cause, Sweet Stuff, Take Action!, You've Got to Be Kidding!